Artists Hans K. Clausen and Kim W. Wilson present a series of site specific works exploring industrial and domestic by-products of human activity, in their joint exhibition What Remains, at Generator Projects. Clausen uses discarded objects from the urban environment with a particular focus on personal objects. 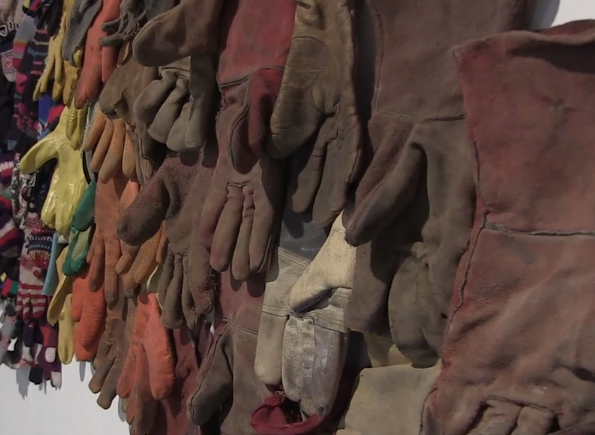 For his installation at Generator Projects, Clausen has created an abstract mural from a thousand gloves found on the streets of Edinburgh, arranging them to resemble a geological scene. Wilson draws inspiration from labour and industrial processes in her work, utilising processes such as extraction and incineration. Her work in What Remains is a culmination of a body of research into the bings in West Lothian, a site of oil shale waste, and uses materials from there in her pieces. What Remains is on at Generator Projects, Dundee, until the 19th April.